Economically relevant traits (ERTs) are those that are directly associated with either a cost or a source of revenue. Not all Expected Progeny Differences (EPDs) represent traits that are ERTs, and instead represent indicator traits. It is important for producers to know the difference between ERTs and indicator traits when making selection decisions. For more information, see the eBEEF.org factsheet "Economically Relevant Traits." In the past, the only way we made improvement was through visual appraisal. As the picture above shows, we can make a change, but how many of us want to wait 100 years? Improvement can be accomplished through management and genetics. In the past we (animal breeding scientist) have probably done a disservice to the industry by producing lots of EPDs, then dumping those in beef producers lap and then expect you all to make meaningful decisions with them. In some situations, this may be as valuable as a free cat. There are many factors that can influence an animals record, for example a weaning weight. Weaning weight may be affected by age of the calf, age of the dam, how much it was feed, and other environmental factors. NBCEC Brown Bagger: Implementation of single step methodologies at Angus Genetics, Inc.
Angus Genetic Services provides evaluations for AAA, CAA, and Charolais breed associations. "The ship has sailed on using genomics. Breeders are using it now, and seeing the benefits of it," said Miller. Previously at AGI, they have been using a two-step approach. In this method, a genomic prediction is created and then is used as an indicator trait for EPD estimation. The calibration data set size has increased dramatically as Angus breeders have used genomic-enhanced EPDs. The orgininal method of incorporting genomic predictions as correlated trait. In the future, we will stop referring to genomic-enhanced EPDs. We don't refer to EPDs as pedigree-enhanced or performance-enhanced, we simply refer to them as EPDs. In the future use of genomic data in genetic prediction will become so routine that we will simply call them EPDs. Is the Animal Model Obsolute? IGS performs genetic evaluations for 12 breed associations from North America. IGS has over 16 million animals in their database and is adding over 400,000 animals per yer. IGS has 84,197 animals with genotypes. Simmental makes up about 40,000 of these genotypes. Currently at IGS they blend the molecular breeding value (MBV, the genomic prediction) with the multi-breed international cattle evaluation. This is more like the blending that occurs with selection indexes. Single-step genomic prediction allows information from genotyped animals to be spread to related animals in the data set. Also, multiple-step genomic predictions were often trained on breeding values, and any errors in the estimation of the breeding values influenced the genomic prediction. There are two approaches to single-step genetic evaluation. Single-step BLUP uses a breeding value model. Single-step Bayesian Regression uses a marker effects model. This fact sheet goes through the fundamentals of how and when producers might use DNA testing in beef cattle production. It covers the different types of tests that are available, how to submit samples and to whom, and what to do with the results. For more information, see the eBEEF.org factsheet "How to Get Started with DNA Testing". When we go from less than a thousand animals to several thousands of animals, genomic predictions can explain about 50% of the genetic variance for important traits. Genomic prediction is working and providing tremendous benefits to seedstock and commercial producers. But, we still struggle with genomic predictions with very little data recording and genomic predictions that work well across breeds. 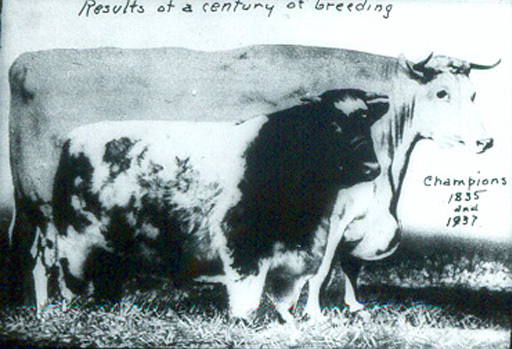 Two methods are used to use genomics in national cattle evaluation. With the genomic pedigree method you track genetic effects more accurately than with pedigree data. With the second method you are relying on linkage on chromosomes between the DNA markers and the variants responsible for the differences (causal mutations).